Egalement, si vous connaissez des groupes communautaires qui cherchent de l’aide, des conseils, ou une assistance quelconque, merci de bien vouloir me donner vos coordonnées. I’m reaching out to you and your community association to let you know of a program that Ecology Ottawa and Park People have embarked upon: les amis des parcs. Funded by the Government of Ontario, les amis des parcs will help francophone residents of Ottawa celebrate their culture in local greenspaces and parks. This week-end (event details below and attached) we will be hosting our first francophone forum that will help interested residents get all the help they need to plan an event. Anything from fundraising, to capacity building, to advertising will be covered and the whole event is designed to help the experienced and non-experienced event planner. ​I believe that there is a large constituency of​ francophone’s in your community, and it would be great to let them know about this opportunity, and the program as a whole. Would you post about and advertise this event? 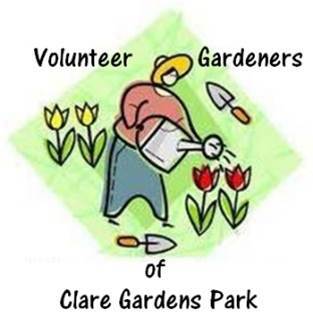 The WCA and the Volunteer Gardeners of Clare Gardens Park are inviting you to help clean up the park. We’ll be building pathways for the new “To Where the Wild Things Are” native plant garden. We’re also hosting a children’s workshop to develop strategies to bring back the fairies to Clare Park. This is in preparation for the Clare Park Celebration on June 22, 2013. To help, bring along gardening gloves, a broom, a wheelbarrow, rakes and/or a shovel. We’ll provide garden bags and gloves. Bring your family and meet some of your neighbours! We encourage residents to attend. This is a copy of a letter written to Councillor Christine Leadman in regards to the development of the United Church property at the corner of Ravenhill and Churchill Avenue. We posted it with permission from the author and invite your feedback and comments. Based on the comments and concerns raised at the public meeting regarding the re-development of the United Church property at the corner of Ravenhill and Churchill, we want to express our concerns to you about the proposed re-development plans, as they were presented at the meeting. The 5-story condominium on Edison Ave. is out of scale with the neighbourhood. A five-story building on a residential street like Edison completely changes the character of the neighbourhood. We are not questioning the design, simply the scale, which would fit in nicely on, for instance, Richmond Road, but is inappropriate for Edison Avenue. There is certainly no precedent in the neighbourhood for a five-story building. The new condominium being built farther south on Churchill is three stories, and it faces Churchill Avenue, not quietly residential Edison Avenue. The recent development of the Jeanne d’Arc property included buildings two stories in height. A 5-story building fronting onto residential Edison Avenue would be incongruous to say the least. The precedent that it would set for future developments in the neighbourhood is, in a word, scary. The proposed entrance to the underground parking lot on Ravenhill needs to be re-thought. Because of the restrictions on traffic during school arrival and pick-up times, the only access to this parking lot during morning and evening ‘rush hours’ is via Kenwood and Edison, which would increase the traffic on Edison, a street which already experiences traffic issues during school drop-off and pick-up times, and which is the main pedestrian route for children attending Churchill School. The access to the underground parking lot should be off Churchill. The third main concern raised at the meeting centered around the issues of parking and ambient noise for concerts at the proposed concert hall in the old church. We feel these concerns are manageable, but plans to do so must be clearly stated as part of the requirements for the re-development plan, and not left to the city or the neighbours to figure out. The good intentions and hard work done by the Westboro United Church to develop the land serves as an exemplary model for redeveloping institutional lands. We are confident that continued discussions among all stakeholders – city, church, community and developers – in the spirit of goodwill and openness, will result in a development that will be a source of community pride, and an example of how redevelopment can be done in the spirit of “making things better”, (rather than “it could have been worse”). We look forward to the next meeting regarding this development. As some of you may already know, OC Transpo eliminated Route 18 in a recent route restructuring. The Hintonburg Community Association is collecting emails of support for this well-used route. Check out their new online form. Fill it out and click “send” to have copies emailed to Councilor Leadman and the HCA. Last September, as part of TransPLAN 2009, OC Transpo cancelled route 18 west of Lebreton. This has meant that for many west end neighbourhoods, there is no longer a direct transit link to downtown. Further, for many people, the connection between many east and west end neighbourhoods that used to be available through route 18 is no longer possible. This has had a disproportionate effect on seniors, many of whom are not in a position to undertake the 20 minute walk to a Transitway Station. As a result, many of them are unable to go out in the community and participate in activities at local seniors’ recreation centres, do their shopping, or attend other social events. Students, many of whom require reliable and regular transit service to make it to their school, have also felt serious adverse effects, as well as commuters who do not work regular work hours (and for whom the new rush-hour only route 150 has been of no assistance). In light of this, residents of west-end neighbourhoods began a petition asking the city to reinstate route 18 west of Lebreton. So far, the response has been terrific, with hundreds of people signing the petition in the space of a few days. Canvassers have walked through Champlain Park, Wellington West and Westboro Beach, and the response from those who were home has been extremely positive for the reinstatement of the service. We need a strong response from our west end communities to ensure that OC Transpo and the city take our demand seriously. Everyone’s assistance is greatly appreciated. I never thought my life would be portrayed in a movie: yet there it is in the Oscar nominated animation, “UP”! Similar to the movie’s key character, my home for 32 years is about to be swallowed by the towering buildings, slated for the Soeurs de la Visitation site at 114 Richmond Rd. A key issue beyond the possible height of buildings, is the proposed back entrance off of Byron Ave. The streets surrounding this site are some of the oldest in Westboro. They contain pre & post war housing on narrow streets – many without sidewalks. Most were purchased as affordable housing prior to the redevelopment of Westboro and are the only investment for many senior homeowners. Now they face the possibility of declining property values and becoming the thoroughfare and parking lot for this site. Residents on my street already struggle with on street parking – it makes turning into driveways very difficult and poses safety issues for children walking on roads without sidewalks to attend school. Additionally the heavily used Byron Strip walkway is now threatened so that buildings on the south side of this complex can be accessed. I have always known that this site would be redeveloped; and so it should be. But I guess I placed too much faith in our City’s Official Plan that appears to be looking after the best interests of residents by using phrases such as “balanced communities”, “compatibility with existing communities”, and paying attention to the “impact on existing or proposed development on adjacent land, in terms such as traffic, housing and employment ratios, and the availability of open space and community services.” How silly of me to not understand that the pockets of individual developers takes precedence and that this is the only way to generate revenues to hold the line on tax increases. Forget existing residents, I guess we are considered expendable as Westboro continues its march towards being a “Destination Site”. It’s obvious that being the providers of free parking (as described on the Westboro Business Association website) is to be our destiny. Oh, how I wish I could tie balloons to my house and move away like the movie depicts. As always, we do like to hear from our community. Please use the comment function here on the WCA blog to submit your feedback.